This Office Sign is Ready to Install! This Ceiling Mount Signage is In Stock Now! This Office Sign is Ready to Ship! 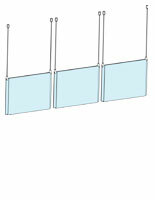 Media Size: 4.5" x 22"
5.75" x 30" 7.75" x 22"
Includes flexible, non-glare lens to prevent inserts from getting damaged and provides clear visibility. Comes with a suction cup for easy removal of lens in order to replace graphics. 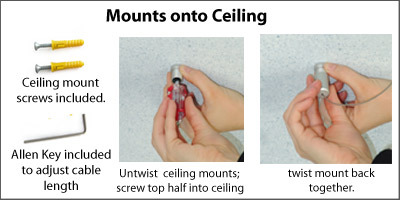 All necessary ceiling hanging hardware is included for immediate setup. 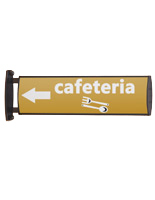 Signage is double sided for a highly visible directional display. 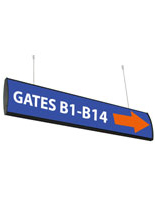 This way finding office sign, also known as a directional display, is black to complement any décor. 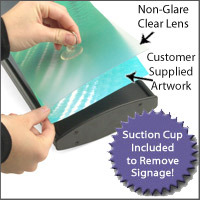 This signage holder has a non-glare lens to prevent reflection and protect inserts from being damaged. 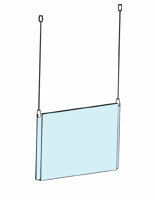 This suspended directional signage, office sign is equipped with nylon coated cable wire and satin silver finished ceiling mounts. 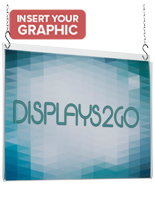 This display is ideal for businesses of all types and is utilized in hospitals, colleges/universities, airports, and more! 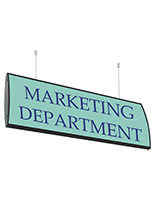 This office sign that comes with ceiling hanging hardware does not include graphics but holds any standard material flexible graphic. The provided suction cup is used to remove the lens without any hassle and switch out graphics when needed. This office sign that is black is double-sided for signage to be viewed from both directions. Directional signage is great for corporate buildings to show visitors how to get around by labeling different departments such as accounting, marketing, engineering, and more. This office sign that is 4-1 2 "h x 22 "w provides sizable presentation space for directing inserts. These displays can be mounted on just about any indoor ceiling utilizing the fixed mounts and included screws and anchors. This convex office sign is made of black anodized aluminum that is certain to outlast plastic constructions. This signage is great for use in hospitals to direct patients and visitors around the corridors. This office sign is also suitable for college buildings where there are many hallways full of classrooms. It is useful to have a sign with a list of classroom numbers with an arrow pointing students in the right direction. 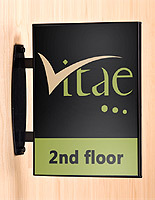 This office sign is simple to use and provides a lasting fixture for a wide variety of businesses. 22.3" x 5.0" x 1.5"